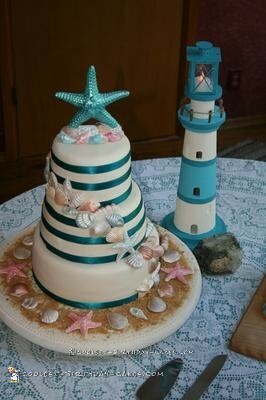 This Seashells wedding cake was a lot of fun to make. I traveled 7 hours with the baked layers and then completed the cake the day before the wedding. The cake is chocolate fudge with chocolate buttercream, ivory vanilla fondant covers the 10, 8, 6″ layers. The ceramic cake top was provided by the bride which I painted with petal dust to match the white chocolate and fondant seashells I made using candy molds, also covered with petal and shimmer dusts. This is the first time I have used non edible ribbon to match the wedding color. I also tried to incorporate a Lighthouse theme into the design without taking away from the seashells theme too much…enjoy.